For the FR, note the halo of silver around the head of the 1:30 (obverse face) eagle--that is the overflow of the pressing and it was not filed away during hand finishing of the piece, very unusual to see that in my (admitted limited) experience, but it gives you a look at the appearance of a "mint" die-pressing. The detail is exquisite! It also illustrates the warning element for how the metal should appear on the cross body sides, as the demarcation and very thin/flat aspect of any residual metal along the line where the two dies met should look like this. Such a thin element was not difficult to file away entirely if effort were made to do so. By contrast, casting things tends to create a wider and more irregular/granular demarcation line if not artfully removed, and it is harder to do so. I think you may have misunderstood me about J. H. Werner--my point was precisely that they marked it because they finished it for the purpose of retail sale, and all the more compelling that you have pretty much nailed down that occuring in 1919, when it would have had to be a retail sale! I'm thinking--though will have to go back through my photo library and Prussian Blue--that the edge finish is more perfectly "flat" than typical for W/FR work. You might see that yourself, actually, since you have a near-immediately-contemporary FR . That might be the sign of how Werner was the ultimate "finisher." Why not Wagner finish it, though? Anyone know their full 1920's story? Good eye Jim on spotting that unfiled material on the 2 o’clock eagle. One question that I have is that there is no direct correspondence between date of manufacture and date of award, especially regarding to the various degree of die damage. I have seen awarded pieces given at later time, but with less degree of die deterioration. Last edited by Erickn; 02-10-2019 at 04:18 PM. I would really like to thank all of you guys for weighing in on this. Zepenthusiast, gmu, Ericn, Don - you guys have experience, observational skills and resources - all of which it takes to be a successful collector. Thanks to Patrick for starting this thread. I am indebted to you for sharing your knowledge and your speculation on this thread. Great observations! Ericn - That is a great JHW piece- I am sorry that I didn't know that you didn't own it anymore when I referred to it. I guess the cross-hatching question boils down to several things mentioned earlier, that is what is the post-war history of the Wagner firm and PlM production and finishing? What is the post-war role of JHW and private vendors? When and why was the first (and subsequent) PlM marked in this way? 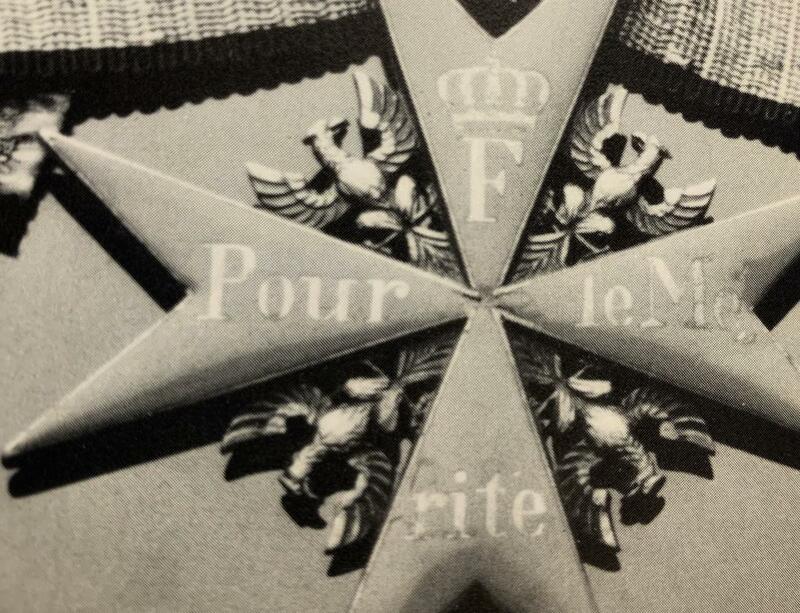 I agree that die wear may have been a factor and cannot be ignored, but I still believe that the awarded pieces may have had an extra step of buffing or what I have called "polishing" of the eagles that accounts for the cross-hatching being faded or worn both on the Bohm piece and on the JHW-marked piece. As was mentioned earlier, you can see this treatment on several pieces in [I]Prussian Blue. I am posting another dot-matrix picture from David Edkins' book. The black and white image makes that part of the finishing stand out a bit. I know that there are much better pictures available, but this one shows good contrast, especially on the legs and chest of the 1:30 and the 7:30 position eagles. This is obviously an awarded piece with enamel damage. The observation of the unremoved material from the die strike is something that I have overlooked on other parts of the eagles, but noticed in the tail feathers on some pieces. I would guess that it was not always practical to file it out of that position without risking damage, especially on the obverse side. If it occurred on the reverse, that side would not be visible in wear anyway. The demands on the producing firms late in the war have already been mentioned. Valuable time and effort may not have been spent as freely removing more material where it didn't matter. Check out the 4:30 position eagle tail on the second picture that I am posting. Am I mistaken, or do I detect just a hint of unremoved material on the tail of the 1:30 eagle on the JHW marked cross (obverse) posted by Eric above? David, the last b&w photo you posted from Edkins book (page 36) shows the plm of Josef Jacobs. Here is a better picture of such piece. I have personally seen it back in the early 90’s when it was owned by Neal W. O’Connor and his Foundation at Princeton, NJ. The photo comes from one of his awesome books on aviation awards. As you can see, Jacobs PLM is a textbook example of a solid silver- gilt Wagner/Friedlander. There is no cross-hatching whatsoever. IMHO the polishing of the eagles was not done deliberately as an after production process. The eagles came out of production with perfectly defined feathers. The polishing occurs naturally by handling the piece afterwards over the years. In the case of Jacobs, we are talking about 60 years. Thanks for the better b&w picture and the identification of that PlM as well as the reference. I will have to look for a copy. You are right- that cross is instantly recognizable by the enamel damage and the wear. Many of these crosses did get very worn over time. It just seems to me that on some examples it amounts to more than just the years of wear on the eagles, as they are worn down in the same way on all of the eagles and in lower spots on the legs and chest than you would expect normal contact wear to appear. I did not mean to infer that this cross had ever been cross-hatched. I included it because of the contrast on the worn areas provided in the picture. Some of the original breast feathering is still visible in spite of the wear, as you have mentioned. This was obviously an awarded piece that was worn every day, including in combat. I am a fan of Josef Jacobs. He is one of the best known PlM winners, having survived the war as one of Germany's 5 leading aces with 48 victories. Imagine what that cross has been through, both in the Great War and later. Going back through these, I feel strongly the cross-hatching is an original---that is to say hand-applied by the original die-pressing entity (which would be Wagner...would have to be, really)--treatment to make up for the lack of breast detail rendered by aging dies. The "un-removed material" around the head of the eagle at ~1:30 (obverse) preceding is spill-over from the die-strike, but what is seen about the tail feathers is not just spill-over per se (that is, something which would have "always' been there and typically required clean-up), but rather flaws due directly to die-wear/breakdown of the actual die-engraving.. Those elements would by nature be difficult to "clean up," because one is not just removing very thin excess material to leave the intended shape, but rather would be trying to re-sculpt the tail feathers on each piece. If the Wagner product were sold/awarded afterward, whether "officially" by Friedlander or privately sold otherwise, one might expect these flaws would be retained (the one on the obverse right-side wing in particular), if nothing else, simply because it wasn't easy to clean them up desirably. If the surface were additionally polished to smooth it out or not, that would presumably be done after the fact of the cross-hatching, either at Wagner or thereafter. Solely just my opinion (very limited as that is), but the polishing is probably either actual wear--consistent with loss of the gilding one might add--or finish work after the cross-hatching was applied. Last edited by Zepenthusiast; 02-17-2019 at 11:35 PM.